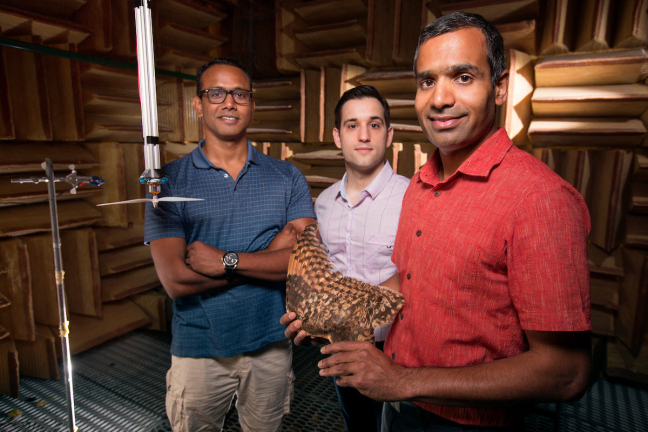 Iowa State researchers, left to right, Bharat Agrawal, Andrew Bodling and Anupam Sharma are studying how owl wings can inspire ultraquiet aircraft and wind turbines. Larger photo. Photos by Christopher Gannon. This article was originally published on news.iastate.edu by Mike Krapfl. Click here to read it in its entirety. AMES, Iowa – Anupam Sharma pulled an accordion folder from the bookshelf above his Iowa State University desk. Inside was the carefully collected and preserved wing of a short-eared owl. Here, he said, could be some clues for developing ultraquiet aircraft and wind turbines. And then Sharma picked up the wing (a specimen collected by Iowa State avian ecologist Stephen Dinsmore) and pointed out the three-part “owl hush kit” that’s responsible for silent flight. These are 3-D printed models of aircraft propeller blades with serrated leading edges inspired by owl wings. simulations that use more than 16,000 processers provided by one of the country’s top-ranked supercomputing facilities at Argonne National Laboratory in Illinois. He and his colleagues hope their studies will produce practical ideas for making ultraquiet aircraft and wind turbines. There have been previous studies of owl wings and silent flight. The U.S. military has also looked at owl flight for ideas for stealth aircraft. But, Sharma said few have taken a high-powered computational approach to the studies. “We can get into details that there is no way you can study with experiments,” Sharma said. Sharma reported some of his numerical investigations earlier this year in Denver during the Aeroacoustics Meeting of the American Institute of Aeronautics and Astronautics. Sharma also described how the downy coat of owl wings inspired his collaborators at Virginia Tech to design model airfoils (the curved shape of an aircraft wing) with a regular series of small, thin “finlets” and canopies near the trailing edge of the blade and running parallel to the airflow. William Devenport, a Virginia Tech professor of aerospace and ocean engineering and director of the university’s Stability Wind Tunnel, led the experiments in Virginia. Sharma has used 3-D printing to quickly develop models to test various ideas and geometries. So far, the studies are telling him the owl has potential to help engineers develop ultraquiet flight and wind energy, although applications might start at smaller scales and low speeds, such as drones or unmanned aerial vehicles. Figure 1: The owl hush kit – unique feather adaptations that enable its silent flight. Top: barn owl wing specimen. Bottom: Photographs through a microscope of (a) leading edge comb, (b) downy coat on flight feathers, and (c) trailing edge fringe. 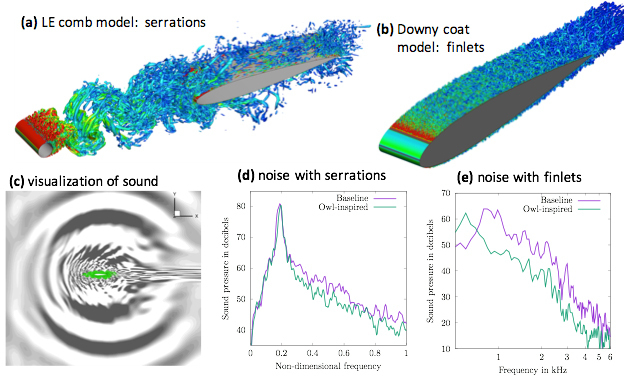 Figure 2: Results of numerical analysis: (a) investigation of a blade geometry with serrations inspired by the leading edge comb of the owl, (b) finlets inspired by the downy coat on flight feathers, (c) visualization of the radiated sound field for a model problem, and (d & e) typical noise reduction observed in the simulations.